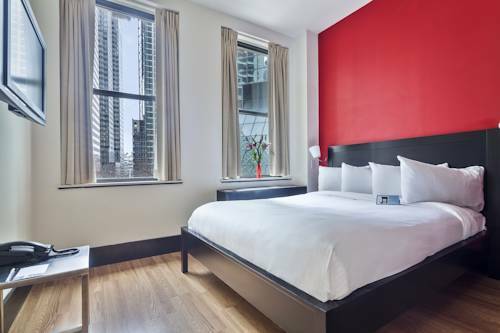 A small luxury hotel in the heart of Downtown Manhattan set amidst a vibrant downtown scene; the very stylish Eurostars Wall Street defines boutique in the strictest sense of the word; the result of which is truly one-of-a-kind. Newly owned by the Spanish company; Eurostars Hotels; the 54 room property has recently completed an extensive room renovation as well as a redesign of common areas including the addition of a wine bar and lounge. Its signature essentials include over-sized rooms with modern design elements and innovative technology; caring personal service and accessible rates all within a vibrant and centrally located downtown location. Each of the rooms features touches not found at other hotels on Wall Street including cathedral ceilings; flat-screen televisions and luxurious marble bathrooms. Offering a host of room types; Eurostars Wall Street is perfect for singles; couples and families traveling either for business or pleasure or both. Each room provides guests with a modish and tasteful atmosphere combined with the comforts of home. The Standard; Deluxe and Executive rooms feature stainless steel mini-refrigerators and microwaves and the One-bedroom suites feature full kitchens with stainless steel appliances including refrigerator; microwave; oven and gas stove. Eurostars Wall Street is in the heart of Downtown Manhattan; a 21st century blend of old colonial churches and gleaming skyscrapers that has become the financial capital of the world. Guests are just minutes away from the South Street Seaport; Wall Street and the New York Stock Exchange. The lower tip of Manhattan called Lower Manhattan or Downtown; where the East and Hudson rivers meet is where New York City began; it was also our nations first capital. The lounge is open each day from 5pm to 11pm. Happy hour specials available daily from 4pm to 7pm. Buffet Breakfast is available from 7am to 10am. Cost is 15 USD per person.